My heart warmed when I snapped this picture. Dressed up and all ready for their special daddy daughter date night, our girls spent time with a devoted father. 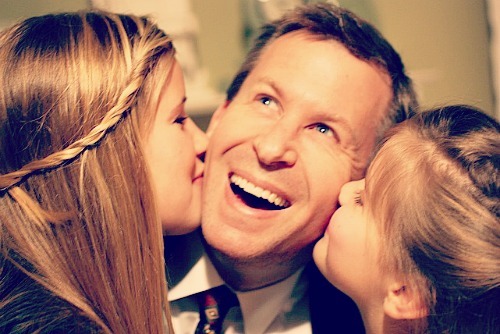 A daddy whose desire to cherish his princess daughters, and model just how a man should treat a lady is at the forefront of their time together. This is a powerful example of the lasting affect a loving, caring father has on the life of his daughter – a foundation of strength, value and confidence. Yet I understand that the absence of that legacy can have an equally powerful affect. A legacy of insecurity, fear or worse, all of which are difficult to overcome. Father’s Day comes with such a myriad of emotions. With this holiday just around the corner, may we pray specifically for the men in our life? I pray for our husbands, that they would lead our next generation of sons and daughters, and that we, as their wives, would lift them up, encourage them, and support them in this calling to build a generational legacy for our children, and our children’s children. That’s an overwhelming responsibility, yet there’s no better time to encourage the Dads and grandfathers in our lives than this Sunday. Father’s Day is meant to be a celebration of thanks to our dads, but often we fall into a typical “card and clothes” present rut. Why not tap into the power of the five love languages, and speak love to him in ways that matter most. In our hustle and bustle of every day life, people rarely take the time to write down encouraging words, and yet for many men, the need for affirmation through this love language is crucial. The written word feeds the soul, and on those days when dad has had a discouraging day at work, he can grab these ” I love you” cards and be reminded of what really matters. 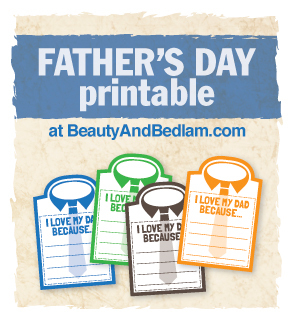 Read more about how we implement a creative tradition idea by hiding these cards, as well as print them here: “I love My Dad Because…” printable. 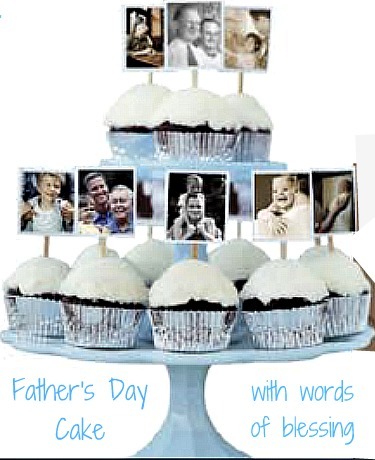 Show your dad just how special he is by giving him the gift that keeps on giving. This Father’s Day Coupon Book is filled with ways to make his day extra meaningful. This speaks to those dads whose love language is best communicated through Acts of Service. 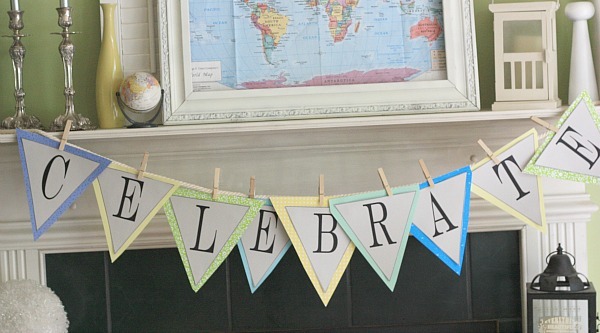 Surprise him with a simple festive banner to celebrate the day. Personalize it with any letters, choice of shape and fonts. Print your free banner template here. 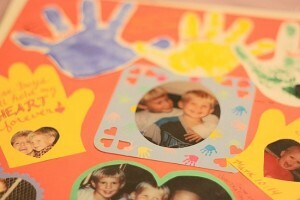 Most of us don’t have time to scrapbook, but a great way to let Dad know how much we love him is to create an ABC book. This is a perfect activity to do with children learning their ABC’s, but I did it with older children, and it was so special. We used a Dollar Store album and collaborated on 26 quick pages. We thought of character traits, inside jokes, and activities we loved to do with Dad, as well as bible verses that we interspersed through out the album. Each item corresponded with a different letter of the alphabet. We let go of perfection, and didn’t try to create the next Mona Lisa. For instance, the Letter P “page” might have GO Packers, Patient Father, Penny Pincher, Peaceful, and Predictable, while the Letter “J” might have a silly joke that Dad always tells (a groaner). This might seem too involved for a last minute gift, but we completed ours in only two hours and not only was it a blast for the kids, but Dad loved reading over every page. Laughter is good medicine, and we all need to laugh more. On Father’s Day, plan a joke telling party with the kids. 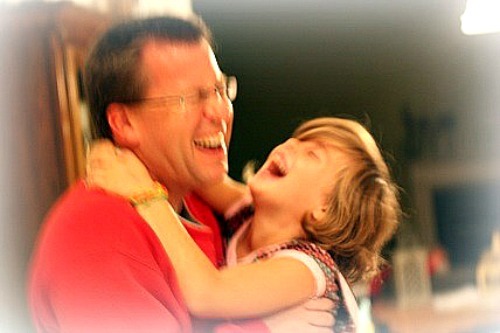 This belly laugh picture came from a spontaneous evening where our family read jokes out loud to each other. I am sure they weren’t that funny, but when one person got going, we just couldn’t stop. I know the Lord must love seeing His children embrace life like that, but unfortunately, we don’t do it enough. If you don’t have a good repertoire of jokes, feel free to use some of my conversation starter questions. Traditionally, we begin our Father’s Day morning with breakfast served in bed. 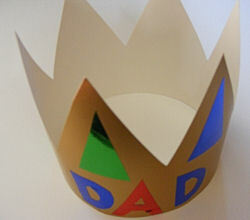 Why don’t we take it up a notch and declare Dad “King for the Day”. The dads in our lives deserve no less than the royal treatment for this Father’s Day. Give him a present he’ll never forget. Remember that this can be as easy or elaborate as you want to make it based on your dad’s personality and preferences. Since Dad has been King all day, he’ll enjoy ending his evening with this adorable Papa Pizza and Father’s Day Cake. This cake is not about the food or a recipe. It’s about sharing special words of blessing over Dad at the end of the day in such a simple, yet meaningful, manner. A few days before Father’s Day, gather pictures of Dad at all ages. Are there special ways that you celebrate Father’s Day? I’d love to hear your plans for this Sunday.